Motorola WT41N0 - Wi-Fi (802.11a/b/g/n), Touch Screen, Alphanumeric 23 keys, 2-Color Keypad, 512MB/2GB, Windows CE 7.0, Extended Battery. Interface cables and charging cradle sold separately. Quad Charging Cradle kit (Part# CRD4001-411EES) Requires AC line cord (Part# 23844-00-00R). With the major increase in volume driven by multi-channel support, demands for the ultimate in customer service, plus increasing regulations for traceability, you need to move more items through your warehouse or distribution center and capture more information about those items than ever before. With the WT41N0 wearable mobile computer on the arms of your workers, you will. Now, workers can keep their hands and eyes on the materials they are handling. No time is lost handling paper or a handheld mobile device. add a ring-style scanner worn on a finger and workers can capture barcodes on the fly, able to document the path of that item for full traceability and verify that the right items are in the right orders, shipped to the right customers at the right time. The result is improved customer satisfaction and loyalty. more throughput with the same staff, driving staff utilization up. and less time spent capturing more information on item movement, driving the cost of compliance with traceability regulations down. Cradle Kit (4-Slot, Ethernet, International). Includes power supply and DC line cord. AC line cord (Part# 23844-00-00R) sold separately. USB Client Communication Cable. USB A to Mini B. 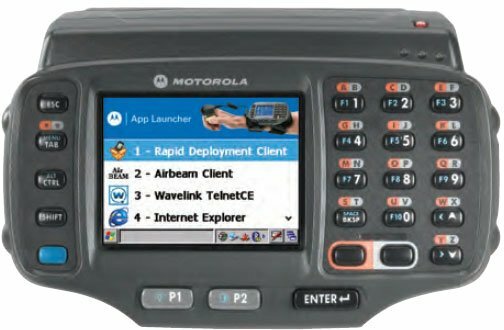 The Motorola WT41N0-T2H27ER is also known as MOT-WT41N0T2H27ER	or WT41N0T2H27ER	.